This book demonstrates how representations of the Victorian suburb in mid- to late-nineteenth century British writing occasioned a literary sub-genre unique to this period, one that attempted to reassure readers that the suburb was a place where outsiders could be controlled and where middle-class values could be enforced. Whelan explores the dissonance created by the differences between the suburban ideal and suburban realities, recognizing the persistence of that ideal in the face of abundant evidence that it was hardly ever realized. She discusses evidence from primary and secondary sources about perceptions and realities of suburban living, showing what it meant to live in a "real" Victorian suburb. 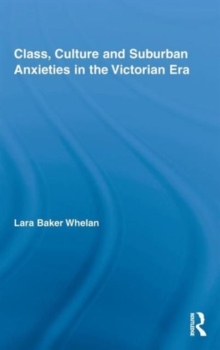 The book also demonstrates how the suburban ideal (with its elements of privacy, cleanliness, rus in urbe, and respectability), in its relation to culturally embedded ideas about the Beautiful and Picturesque, gained such a strong foothold in the Victorian middle class that contemplating its failure caused intense anxiety. Whelan goes on to trace the ways in which this anxiety is represented in literature.